Hello Allison and NosillaCastaways, Trevor from Canberra with something a little different. Usually listener contributions are about the latest software or hardware, however my experience is in part a journey back in time and addresses an archivists’ ongoing dilemma. Back in the 1980s and 1990s Apple II computers were in widespread use in schools, homes and by professionals around Australia. The data saved to those big, old 5.25” floppy disks now languish in desk draws or storage boxes along with research papers and manuscripts. The problem to be solved is how to transfer that historical data from those disks so that it can to be accessed now and in the future. Collections of papers and disks are sometimes donated to the National Library of Australia (NLA) and it is the responsibility of the NLA Digital Preservation Unit to try to make the data on the disks accessible to others. After helping them with software donations, the NLA Digital Preservation Unit asked if I could provide advice on how to create disk images on Apple II computers and transfer them to a modern computer. Thirty years ago I had built a fully loaded Apple IIe computer system and together with my early Macintosh computer could migrate data from the Apple IIe to a Mac or IBM personal computer. I had actually migrated data from Apple II disks to PC disks for the Library in 1995, but this project would be a bit different. Unfortunately I consigned my collection of “old” computers to the tip when I moved house in 2001. I felt confident that I could develop a workflow solution if I could find a functioning Apple II computer to work at my own pace at home. The first Apple IIe I found booted but the power supply smoked and failed after 30 seconds. I was next offered a few big boxes full of Apple II Europlus mother boards, cases, power supplies, disk drives, peripheral cards and books. Unfortunately non of the 5 included power supplies worked. Eventually I found old colleague who still had an operational Apple IIe and that made all the difference. I could develop a workflow and test most of the components I had accumulated to determine what was useful and what needed to be rebuilt. My main concern was the old Apple II Disk Drive which always sounded terrible when booting the computer. They had a death rattle when they were new and they still sound like they might fail at any moment, given the chance. I have included a link in the show notes to demonstrate that awful sound. Floppy Emu proved perfect for booting disk images and transferring files to and from vintage computers to modern machines. I just plugged in the Emu board, and I was up and running in seconds. I can download Apple II disk images on my Mac and transfer them to the micro-SD memory card and plug it into the Apple II and run them. 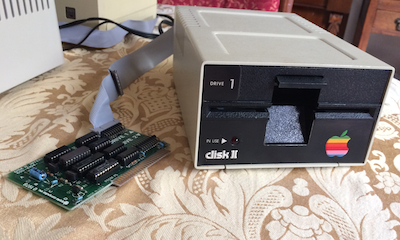 I installed Virtual II on my MacBook Pro and copied the Apple Disk Transfer Apple II disk image to the Floppy Emu but still needed a way to physically connect the Apple II Super Serial Card with a DB25 connector to the USB port of my MacBook Pro. When Apple released the original iMac G3 in1998 it was the first Mac with a USB port. Before the USB ports were introduced Macs used SCSI connections for hard drives, Apple Desktop Bus connectors for keyboards & mice and serial ports for modems and other peripherals which were small round 8 pin Mini-DIN plugs and sockets. Conversion devices were created to bridge this Mini-DIN to USB technology gap. 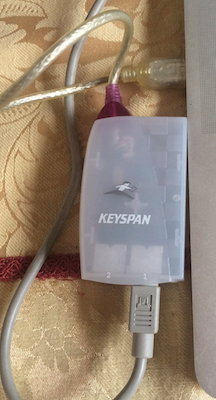 As luck would have it, I just happened to have an old Keyspan Serial-to-USB converter device and an old Apple ImageWriter printer cable. The cable had a DB25 plug at one end to suit the Apple II and a Mini-DIN plug at the other to fit the Keyspan, which allowed me to then connect the two computers together. Now who would have thought that connecting an Apple II computer built in 1984 to a 1998 Keyspan converter device then to a modern MacBook Pro would be plain sailing? The fact that it did eventually work was amazing. I tried starting up with everything connected but the MacBook kept chucking kernel panics so I tried plugging in the Keyspan device after the MacBook was up and running. Sometimes it would instantly shut down and sometimes it would operate normally so I made the most of the times it ran normally. The Apple Disk Transfer utility runs simultaneously on the Apple II and the MacBook. The program is loaded into the Apple II memory and the floppy disk to be read on the Apple II is inserted into the disk drive. The Apple II slowly reads the 140 KB floppy disk, a few sectors at a time (the disk has 35 tracks with 16 sectors per track) then sends the data to the MacBook which acknowledges the receipt and stands by to receive another batch of sectors. 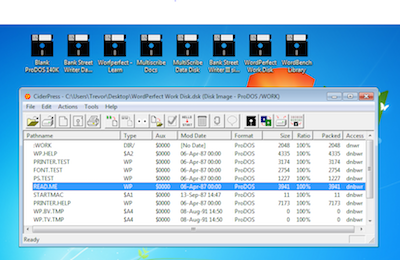 At the end of the transfer process the Mac saves the disk image file in a format that can be read by other programs. Now I have disk images I can mount them in Virtual II on my Mac and run them like a real Apple II computer. In a collection of old 5.25 floppy disks I found a disk with a membership list of ACT Apple Users from 1986. Looking through the list in Virtual II running AppleWorks, I noticed that my brother Tony had been a member, joining in 1984 with an Apple IIc computer. When I reminded him of this he could not remember even owning an Apple computer let alone being a member of ACTApple. 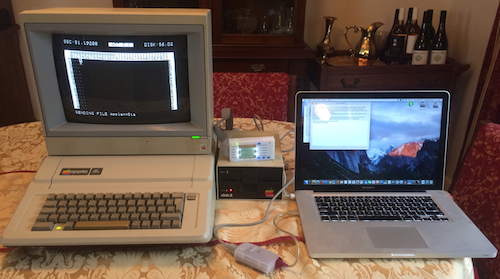 In this photo you can see the Apple IIe running ADT to send disk image files on the left; the Apple Disk II with the Floppy Emu sitting on top and the Keyspan converter in the centre; and the MacBook Pro also running ADT to receive disk image files on the right. By the way, in 2005 the CiderPress author, Andy McFadden, started working at a small startup called Android. A couple months later it was bought by Google. 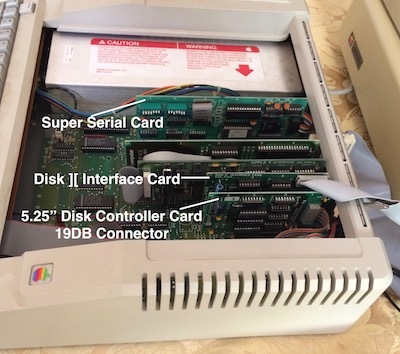 I have rebuilt two power supplies for my Apple II computers and have my Apple IIe working. I’ve reached my limit with the Apple II Europlus which had been heavily modified by a previous owner. I was able to confirm it would boot programs from disk or the Floppy Emu, but the two keyboards in the big box of bits but both failed to function. I’ll look for someone with more experience to take the Apple II Europlus equipment off my hands and try to put it to good use. A recent bonus for me occurred when I was clearing out my mother’s home. My dad was a bit of a hoarder and I discovered a boxed up Apple IIc system that was still operational. So now my collection of Apple II computers is growing once more, over thirty years from their initial release. I documented the whole process in Clarify then emailed my contact at the NLA Digital Preservation Unit that I have developed a workflow to solve his problem. He was impressed and wanted to organise a demonstration with his boss, but that is yet to happen. Now does anyone need to access any data on old Apple II 5.25” disks?